When a mysterious envelope arrives for Jake Ransom, he and his older sister, Kady, are plunged into a gripping chain of events. An artifact found by their parents—on the expedition from which they never returned—leads Jake and Kady to a strange world inhabited by a peculiar mix of long-lost civilizations, a world that may hold the key to their parents’ disappearance. James Rollins, New York Times bestselling master of adventure for adults, doesn’t hold back on the thrills in this middle-grade tale that will satisfy boys and girls of all ages. With amazing aplom, Jake Ransom and the Skull King’s Shadow delivers with authentic richness, as well as with the adrenaline fun factor. Thirteen year-old Jake Ransom is ahead of his class when it comes to science, and has a special love for archeology. So when Jake and Kady are invited an exhibit at the British Museum in honor of their parents, he’s excited and intrigued. He’s also suspicious. The logo for the company sponsoring the exhibit reminds Jake of a recent nightmare. Is it a coincidence, or not? The large golden pyramid at the exhibit, gives Jake a hunch about the artifact that came in the mysterious package. A hunch that sends him and Kady tumbing through time to a mythical city called Calypsos. Always a scientist, Jake assesses the situation with analytic detachment. Fifteen year-old Kady isn’t as level-headed. She’s scared and angry. But who can blame her? Almost immediately, a dinosaur—that Jake knows the name of—decides they’re its next happy meal. Luckily, a Mayan girl and a Roman boy, about their same ages (Marika and Pindor), get Jake and Kady safely inside the protected walls of their city. Once in back in civilization, Kady adapts to her new surroundings with speed and grace. Her impulsive gutsiness provides a balance to Jake’s is rational straight-ahead approach. Jake and Kady tumbled through time, bringing them closer to the evil Skull King. In order to stay alive, Jake has to discover who the Skull King is and what he really wants. The stakes are raised when Colypsos is invaded by the Skull King’s mutant monsters. For Jake and Kady to outwit the Skull King, they must combine their strengths and trust in the support of their new friends. The characters: Jake and Kady are strong in different ways, and both have their share of flaws. I especially liked how Rollins translated Kady’s high school twirl squad skills into an adeptness at swordsmanship. The secondary characters are unique individuals, who satisfactorily round out the story. The world: Rollins’ knowledge of animals and love of science shines through on every page. I learned quite a bit, without even trying. The inhabitants of this world are created from a blend of historical facts from various time periods, grounding the fantasy in believability. Likewise, the science fiction elements of the story are woven through with scientific facts that bring along a refreshing dose of authenticity. The mystery: Multiple threads intertwine to shape a story that is rich in intrigue and suspense. Where are Jake and Kady’s parents? Are they still alive? 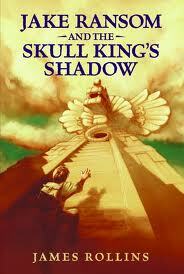 Who is the Skull King and why does he want Jake and Kady? How will they ever get back home? No spoilers here. You have to read the book to find out. 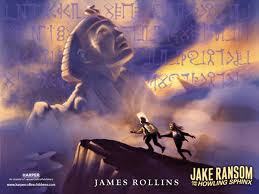 The adventure: This is an Indiana-Jones-esque thrill ride that girls as well as boys will enjoy. The fast pace would makes this an excellent choice for a reluctant reader, as well as for those of us who thrive on adrenaline spiked escapism. Jake and Kady continue their search for their parents, as the threat of the Skull King presses closer in the next installment of this adventure: Jake Ransom and the Howling Sphinx. Billy Broccoli is starting middle school at the same school where his mother is the principal. As if that’s not bad enough, he’s also dealing with a new step-father, a bratty older step-sister, a new house—that’s really old–a new neighborhood away from his old friends. What were the chances things could go that wrong? Apparently, a lot. Because they get worse. His step-sister took the best room in their new-old house, leaving Billy with the lavender and pink bedroom. He soon discovers that the rainbow and pony wallpaper is the least of his worries, when a ghost materializes insisting it’s still his room, and that he’s Billy’s personal ghost. “You’re not my ghost! I never asked for a ghost. I asked for an iPod, I asked for my own cell phone, I asked for a red BMX bike with black trim. But never, on any list, at any time, anywhere, did I ever ask for a ghost,” said Billy. “Lucky you. I show and you didn’t even have to ask. You hit the jackpot, ducky. Hoover Porterhouse II is a fourteen year-old ghost—going on 114—with a tweaked sense of humor and a whole lot of attitude. So much ‘tude, he’s failed his celestial progress reports for 99 years. The thing is, if he doesn’t clean up his spirit-ual act fast, he’ll be haunting the same plot of ground for eternity. And the Hoove would rather die again than let that happen. So when an obnoxious school bully sets out to trash Billy’s reputation, the Hoove swoops in with an action plan for revenge. The Hoove helps Billy find the courage to set things right, and the Billy shows the Hoove the honorable way to stand up to a bully. In the end, the Hoove’s grade in Helping Others shows improvement, Billy rules the school, and it all comes down to the Hoove’s Rule Number Forty-Two: Stay cool. The quirky characters: The cast of secondary characters are as quirkily fun as Billy and the Hoove. There’s the geeky dentist step-father with his “teeth ties”, the diva older step-sister with her own rock band, and the school-bully neighbor who has a secret you won’t believe. The family conflicts: The interactions between Billy, his mother, step-father, and step-sister all ring true. It’s easy to empathize with Billy and his adjustment to the new family dynamics and his new neighborhood, home, and school. The blast-from-the past culture clash: The colloquial language gap between the Hoove—who turned 14 ninety-nine years ago—and Billy adds an amusing layer of texture. The gender-neutral fun: Billy’s anxieties and dilemma’s will be as appealing to girls as they are boys. I bought this book for my eight year-old niece, and I know that she’ll love it. The lesson without a lecture: This story does an amazing job of addressing the topic of bullying—along with the appropriate way to stand up to a bully—with ease and grace. 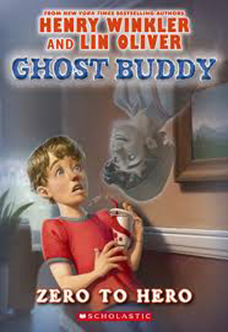 Ghost Buddy #2: Mind If I Read Your Mind? 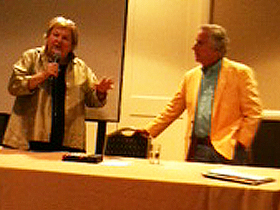 Henry Winkler and Lin Olver are the New York Times Bestselling authors of the Hank Zipzer: The World’s Best Under-Achiever series. Lin Oliver and Henry Winkler have accomplished some amazing things in their exceptional careers, but they’re most proud of the books they write for young readers. Ivan is a mighty Silverback gorilla who’s grown up in captivity, at the Exit 8 Big Top Mall. Not exactly the best conditions. Ivan accepts his fate by blocking out memories of the jungle he came from and creating art with the crayons and paper given to him by the keeper’s young daughter. Stella, an elderly performing elephant in the cage next to Ivan, is different. She remembers her past and longs for a better life. Her festering rage fuels her hope for a better life. The days at the Exit 8 Big Top Mall are all the same, until the owner brings in a baby elephant named Ruby to help boost the failing business. Stella cares for scared and lonely Ruby like a true elephant mother, until an untreated injury threatens her life. As Stella’s dying, she asks Ivan to save Ruby from a fate of performing four shows a day, 365 days a year. Ivan says he will, to make his friend happy in her final moments, but he doesn’t know how he’ll keep that promise. Stella’s death forces Ivan to remember his painful past and realize his purpose in life … protecting his family. Through the pain of his epiphany, Ivan sees the way to freeing Ruby. He works tirelessly on new paintings to this end, and his plan is carried to fruition with the help of the keeper’s young daughter. Ruby isn’t the only one Ivan saves, however. His selflessness takes him and the rest of the animals at the Exit 8 Big Top Mall to natural habitats where they can be with those of their own kind. By the end of this story I was crying again, except this time for a totally different reason. It would have been easy for Katherine Applegate to paint all people as villains in this story, but she doesn’t. She alludes to the injustices done to Ivan and Ruby when they were taken from their families in the wild, but she also mentions the people who helped them. Even the owner of the Exit 8 Big Top Mall is cast in a sympathetic light, showing us that he cared about the animals in his charge and was doing the best he could. 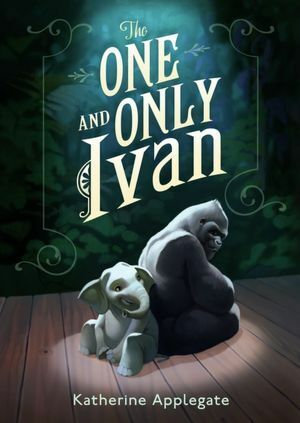 Children will love with Ivan and his friends, connecting with their genuineness. Adults will be moved by the honesty, heart, and hope that shines through Katherine Applegate’s elegant prose. In cheering for Ivan and his friends, we cheer for our own humanity, and our own possibilities. Read this. There is a real Ivan, a gorilla who now lives at Zoo Atlanta. Check out what Katherine Applegate says about the REAL Ivan here.